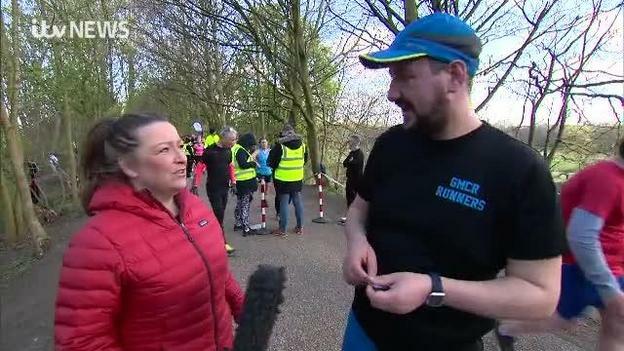 Whilst many of us could easily admit to a marathon chocolate eating session over the weekend, we meet the man from Cheshire who's running eight of them this week. Dad of two Simon Benbow from Nantwich set off from his home this morning, he'll be running to London where he will then take on the marathon. He's doing it to raise money for a cancer charity after he lost his mum to the disease as well as surviving skin cancer himself. Follow Simon's progress here and find out more about more about the charity as well as donation information here. Fire crews are tackling a large moorland fire in the grounds of one of the North West's best known stately homes. Lyme Hall at Disley in Cheshire is where Pride and Prejudice was filmed for TV in 1995. Cheshire Fire and Rescue service say the fire is located on a large moorland area south of Knightslow woods. Lyme Park has been closed to the public and visitors are advised to stay away.